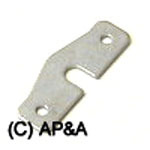 Metal pop bumper yoke used on many Williams and late-model Bally games. Can also be used on similar makes/models. Commonly broken part, especially on the later-model games. This is the metal piece of the 2-part yoke assembly that goes on top of the fiber or bakelite yoke. Replaces discontinued Data East # 535-5877-00 and similar others.